Sunday, March 13, 2010 - 8am PST. Benevolent Bodyguard - this guy is an MVP. Think of him as a counterspell that hits for 1. He is SO important that I don't think white weenie would be where it's at without him. His quote says it all, "My destiny is to save others so their destinies may be achieved." Selfless and totally insane as a one drop, this guy is not to be underestimated, unless you’re my opponent, then by all means...PLEASE underestimate him! Razor Golem - Capt. Spiky at most costs 3 in my long history of playing white weenie. Seriously, a 3/4 for three mana!!! 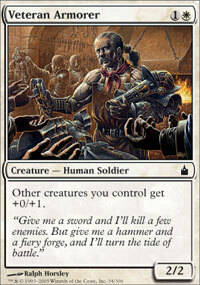 - Phyrexian War Beast is doing infinite donkey-kicks in a jealous rage over this guy. More often, at four mana, you can drop two of these guys..that's a curve even a Tarmogoyf wouldn't sneer at! The Razor Golem and Shade of Trokair are the solo reasons this deck stays in one pious color. Razor Golem has single-handedly won me so many games I can't keep track of the statistic. Additionally I had little respect for vigilance prior to playing this house. His un-tap-ability is quite a thorn in an opponent's side making for some surprising tempo advantages. Shade of Trokair - This guy doesn't need much explanation. Nantuko Shade is nuts, and this guy technically costs one less with the help of suspend. Shade of Trokair also has the benefit of being a domino against control strategies - suspending one of these lets you bank all your spells/creatures behind it, knowing that if your opponent is playing counterspells, he or she simply MUST COUNTER this guy, and then the real weenie wildness can unload. Aside from the above strategy vs. control, this guy and Order of Leitbur justify the late game mana flood that can sometimes happen to any deck, adding to the consistency of the early game, and the crushing power of the late game. This happened in the very first round playing against Teachings/Control...by choosing to suspend my Shade rather than walk into a counter and/or removal, I instead waited, gaining 3 more creatures for my suspended onslaught three turns away...which turned out to be a winning move. Kor Skyfisher Holy Hitchens! What was Wizards thinking creating this guy and his "drawback"?! This has to be perhaps the best white flyer (for the cost) in the game's history. From bouncing your 'responded to' Journey to Nowhere - to helping your opening mana curve, this 2/3 flyer is absolutely insane in any format. Many times vs. goblins, a first game Journey to Nowhere is answered by sacrificing to a Mogg Raider in response to the intended target - this leaves your Journey to Nowhere voided and still on the table, just waiting for that next skyfisher to come around and make it useful all over again. When playing with Soul Wardens - this is used to bounce a crucial creature for life advantage in a pinch...even better is bouncing a depleted Serrated Arrows, Kor Sanctifiers, Safehold Elite, Icatian Javelineers or the obvious target an Aven Riftwatcher. No matter what the target, the Kor Skyfisher is fishing in a VERY lush stream where everyone likes sushi! Order of Leitbur - Imagine you're playing this, and your opponent casts a simple white bear like Benalish Cavalry at the very late stages of the game. It's quite obvious which will have the advantage. However at the beginning of a game, they're pretty equal but as the game goes on, the decision over which one you'd like to have gets downright ridiculous. Similar to a dehydrated runner on the first mile of a marathon, sure they'd be pretty strong on the first mile, however on the last mile they'd be in a sorry state. As mentioned above in the Shade section - Order of Leitbur helps justify the mana base late game. Icatian Javelineers - I'm one of the few white weenie players who don't really respect this guy. 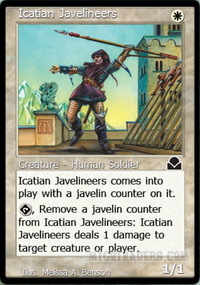 I understand the logic behind the card...but having access to Serrated Arrows after side boarding really makes this guy seem sub-optimal to me, two Serrated Arrows is the equivalent to playing 6 Icatian Javelineers. If pauper were a format with a hundred card minimum, then of course I'd include this guy, but not at sixty cards. Even in the mirror match up, your Benevolent Bodyguard has the one-to-one answer against this guy. I'm not saying there aren’t times he's obviously useful, it's just that white weenie is such a finely tuned machine now, that I just don't see a spot for him, even with the help of a few Kor Skyfishers to reset him. Amrou Scout - What a history I've had with this card. From main decking four, then two...then none. Very similar to the above logic in the Icatian Javelineers - you seem to only like this guy in games you're already winning - I'm not saying it's not a super card - just that I personally don't like seeing it when I draw a card. White weenie is a very active, turn-by-turn game state. There's not much time to wait with four mana open to "trick" your opponent. Please note: I obviously know this guy is amazing in a vacuum of only having him and being able to fetch seven, (four additional Amrou Scout and four Aven Riftwatcher. This scenario rarely comes up, and I really don't like to see him in my opening hand unless playing against islands, which justifies four copies to consistently slip past counter magic...which if in any other match up is a crucial error. Additionally this guy is about as weak as a dehydrated runner on the first mile of a marathon - in the hundreds of games I've had him on board, he's attacked maybe twenty of those times to very mana depleted opponents that I was already beating. He's blocked a whopping nineteen (each time dying and only delaying a loss by one turn). No thanks. If the future holds many more Rebels for white weenie, then perhaps he'll need a second look, but until then I hope my white weenie opponents are playing this - because I'm NOT! Veteran Armorsmith, Veteran Armorer - these two, despite the quantities - offer a solution to many mass-removal answers your red and black opponents may have. Each offer a benefit of a +0/1 backside, the superior of the two being the Veteran Armorer for the obvious reason that he helps non-soldiers which is the vast majority of the deck. Crimson Acolyte - If goblins are at large, this guy is crazy good. There's no reason to go into the advantages of playing these guys vs. a red/goblin environment - and perhaps an even better meta-game call (this week anyway) rather than Safehold Elite, would have been four of these circus freaks. I wouldn't go as far as I did a few months back, when I used Crimson Acolytes in combination with Palace Guard - it worked great and was quite funny too! This is the 2009/10 White Weenie deck list above. Aven Riftwatcher - Life personified. The air attack is heavily in favor of most white weenie match-ups....and this guy, with his/her brother/sister in arms Kor Skyfisher nearby is simply a recipe for victory. Fetch-able via it's rebel visa if using the above mentioned Amrou Scout - the Aven Riftwatcher is a 2/3 house that nets you a consistent four life. Hmmm...let's review - four life is a fifth of your total - and you get to usually hit your opponent for four in the meantime...ok, this is officially awesome. Safehold Elite is money vs. both red and/or black strategies. Buying you the time needed to smash face vs. either of the above two mentioned strategies....or any other rogue component you may face. The only knock against this guy is that he's a two drop, in a deck that can tend to get a bit flooded on turn two with TOO many options, but too many options is a nice 'problem' to have. Shelter - A more surprising and expensive version of Benevolent Bodyguard - I love this card...I simply can't find the space, either main decked or in the sideboard, to use it. At one point I was so thirsty for the ability to draw a card that I looked to these as well as the scry ability in cards like Stand Firm. Chasing a colors weak points is always worth a try, but in the end this train of thought usually nets you a weaker, less-focused deck. Such was the case with the above two in my testing. Secluded Steppe - I won back in December 09' playing with two of these. My logic at the time being that at twenty-two lands...white weenie tended to get flooded mid/late at horrible times, and I wanted a way to prevent this drawback from happening so often. Truth be told, it was nice to see them towards the mid to late game, but just disastrous in your opening hand. Again the issue being that your first five to six turns every single mana is being used to its fullest. It's a fifty/fifty gamble, and I always prefer consistency. Additionally there are some rare games where your Razor Golem isn't able to come play, cause you had to actually play one to prevent a mulligan down to defeat. This is a rare scenario, but I did encounter it about three times out of forty with said deck list. Unmake - Just click on this card to understand its instant goodness. The only drawback is cards like Valeron Outlander and above mentioned Order of Leitbur - aside from that, this card is quite overpowered for the pauper format and lends to some great combat tricks vs. the entire field. Journey to Nowhere - A two mana removal solution - okay, I'm in love. Add to that the above-mentioned synergy of the Kor Skyfisher re-usability and you have some seriously devastating removal for a measly 1W. Seriously, what more do you want from a spell?! 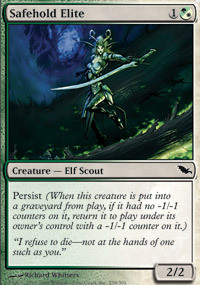 Serrated Arrows - Main decked or sideboard (depending on the meta game) - this card is always a valid inclusion. 4xBenevolent Unicorn - Still surprises me how many people have never heard of this card. It is the nemesis to Grapeshot. The partial answer to storm. Your sideboard, (in my biased opinion) MUST always have four of these. 3xPrismatic Strands - I might catch a lof of grief/hate for this, but as far as my research concludes - I see no reference to this card until I started playing pauper. This is an MVP vs. anything mono-colored, see also: red and/or black. 3-4xHoly Light - I'm an atheist at heart, but even so, I'll sing the praises of this superstitious card any day vs. goblins and/or elvin strategies. Just remember your Razor Golem is also considered "Unworthy" to the totalitarian sky man of "___________" faith. 0-4xStandard Bearer - if facing rogue and/or goblins - this guy has his place. Armadillo Cloak - now targets YOUR creature. A Mogg Raider got you down, just wait 'til he has to activate targeting your pious peons. Combined with Benevolent Bodyguard this can seal the deal against many a strategy - personally however, I've found it lacking and I genuinely wish it were always something else. 0-2xKor Sanctifiers - Rogue nasty-hate...CHECK! affinity and Kor Skyfisher re-usability, CHECK! Strange Armadillo Cloak and/or Tortured Existence engine got you down...CHECK. 0-3xSerrated Arrows - This I hate to write about, simply because it's the main bane to white weenie. In the finals (mentioned below) I faced this card against a goblin deck, which was a great meta game call by Mammonth! - Although it wasn't enough for my great white might! The above '2009 White Weenie' is a very solid base with which to start any weenie-like endeavor. As with any white weenie build, it's very consistent, resilient and can put up a fight with even some extended deck lists! - Ok maybe only rogue ones ;) If you're new to pauper magic, this is the list you want to buy and go for. Remember only through personal playing and individual strategy will you be able to modify the above list(s) and choices. Okay, so I got first place out of a vast field...bravo...pats on the back etc., but what would I change? The answer is Dust to Dust. I'd simply remove the two copies I have of Dust to Dust for two Kor Sanctifiers - which are still awesome vs. affinity via Kor Skyfisher and also have plenty of game vs. the mirror and TE strategies. This would have possibly helped with my only loss of the entire tournament vs. J_G_L expertly playing a pauper form of "junk." - This isn't an insult, quite the opposite. For those new readers who haven't heard the term, 'Junk' is a magic term used when putting together a bunch of good cards from many mana sources:. Unmake has no game vs. Valeron Outlander - as technically Unmake is BOTH a white AND black spell. This compounded by the fact that in game two, the Valeron Outlander had two Armadillo Cloak atop it's noble back. As for the tournament itself, I'll try and be brief, as games three, five, six and seven were all against roughly the same goblin deck list. Seriously, I didn't lose a single game vs. anything of the goblin persuasion, my total record being perfect 8-0 vs. those nose-picking, narrow-minded, mountain-clinging bastards! :) The only chance a goblin deck has at beating my solution, is for me to get mana screwed and them to have the nuts. 1) Poor Karakusk, I crushed him in round six, 2-0...then met him in the first round of the top eight, and did the same, 2-0. His comment said it all about the frustration goblins have vs. this deck, "...not you again." A 13/14 shade is nothing to laugh about! 1) Crazy consistency - CHECK. 2) Consistent pressure - CHECK. 3) Ability to deal with any permanent - CHECK. 4) Has game vs. any deck - CHECK. 5) Respectable life gain that also attacks - CHECK. 6) The most hateful sideboard in recent memory - CHECK. So if you still need reasons to play this deck - perhaps white isn't your color. And special thanks to Paul Grasshoff. My editor who saved you all from my horrible homonym misuse! Nick##### used to run Prismatic Strands in his ungodly awful GWB pile of a rogue deck, years ago. It's been around on and off in Pauper for a while, actually. Probably two dozen people independently "discovered" it as soon as Muscle Sliver came out and GW Slivers appeared as a viable deck in a field then full of Grapeshot, MBC, and Burn. I'm pretty sure that I've run it one place or another, too. If you're going to make claims like that, I ask that you please check Gatherling's deck search first. In less than a minute of searching, I discovered a deck from TPDC 5.09(!) running 4 x Prismatic Strands in the main -- and dozens upon dozens more from recent years. I read that line differently. To me it read that he could not find anyone other than paupers using the card. Is there an uncommon or rare that does the same job better? Or do full powered players not like blowing out a mono color deck? The problem may be that currently Gatherling is set up to only show the most recent 20 results for any search. I had to be a bit clever. I searched deck name "Cloak" and card "Prismatic Strands" in order to find the TPDC 5.09 occurrence. I can't remember Nick####'s numbers, so that one comes from direct personal knowledge. I read this article twice, and am still unsure of what you're trying to say. You talk about explaining why White Weenie is always a viable choice, but really just talks in generalities about match ups (except for the check list at the end, which is far too brief). White Weenie, in my experience, wins where other aggro decks fail because of the mana efficiency of Shade and Order (you touch on this briefly). Knight of Sursi: An additional one drop that presents a real threat in the air thanks to flanking. In metas crowded with Mulldrifters and Riftwatchers, I love this guy. Akrasan Squire: Another card that is wholly metagame dependent. When Blue control is at an apex, this guy is stellar, often doing a majority of damage. Temporal Isolation/Sunlance: More removal options, and cheap to. The game shots are confusing, and not that easy to follow. I applaud you for including them, but I have issues understanding exactly what is going on in each shot. I honestly just made an editing error there. Had him in the listing (sursi) as I totally agree with you that against islands he's nuts. Up until 3 weeks back I had them maindecked, up until the meta went so goblin crazy. I wrote on top of the merged one, "WHAT A MESS!" - guess the point was missed. I also noted i didn't want to do a typical round/round breakdown (which seems tired and boring) especially considering so many games were against roughtly the same deck, I saw this as a neat way to blend the matches into a goblin stew. I'll make sure to stay clear of this in the future to avoid any visual confusion. Sorry Shard, just what I call that type of deck. Two different decks can both be consistant. My point (however unclear and/or I missed) was that WW is very consistant over goblins...and plays good vs the rest of the field too. All valid points thanks all. Wow, thanks. First positive comment! I should have been clearer, as this was my intention...to have a reference point for a few years to link to and modify for all WW players. Glad at least you liked it. Let me guess, you don't play goblins? ;) I think most the haters here (see also:99% of posts) have a crush on them. So... this article kind of bugged me. I gave it a chance at first because I was thinking, ok, he's trying to establish himself as a good player. However, after that, almost the entire article was just you posting your numerous top 8s and how goblin decks just have no shot against you because you and your ww deck are just amazing. I mean, really, there wasn't any actual content in this article other than "I'm good and so is ww". lol...sorry Numdiar - I can see it being seen that way, did you see the area I where I wrote about my loss? It had screengraps/pics. I guess I could have used a few less adjectives like Smashing, Crushed,etc.., - but what else would you call 8-0 against goblins? Perhaps, since you were also running goblins, it stung a bit more than a casual readers take? arn't they decent vs. crypt rats? also i'm confused about the soul wardens, do you attack with them? I like that you thank your editor. Very classy. To respond to what you said above, no I don't care if you say things about goblins or any other deck. The only point I was making was that almost all of the article was just bragging without any actual content. I mean, cool you won an event. Grats. But it's pretty much like the whole article was written just to say "hey guys I won a premier event let me tell you how good I am and how good my deck is". I suspect Num would be fine with arrogant and conceited if the article had more of what he considers meat. I think using the words "Crushed & Smashed" got you guys all riled up. Last I looked, 8-0 is a smashing, skunking etc.., I wouldn't have writen it had it been 7-1 etc.., If any of you good players beat me that bad, have at it...I'll smile and confirm what a smashing/bashing it was, because IT WAS! Perhaps my feelings are harder to hurt or something. The first two sentences of the article make fun of my feeble attempt last week. Additionally the MAJORITY of the actual tourney report is about the deck that beat me and how deluxe it was. I haven't always seen eye to eye with some of your articles (See your article regarding cheating). I will say however, this article I found very interesting. I really enjoyed the pictures, the Wheaties thing is classic. The pictures provide breaks in the content which makes it easier on my eyes. I even found myself wanting to try a White Weenie list again. It's easy for people to flame when you write an article focusing around your winning. No one wants to hear a tournament report about someone get owned, if they do I have plenty of articles to write. I think the true problem is your history. Sometimes your articles do seem arrogant. Maybe its the comments you have made in the past or maybe it's people opinions that have been formed in the past. I didn't have a huge problem with the article, I think having a little arrogance in this game isn't always a bad thing. You just need to know when to show your emotions and when to pull back a little bit. Summary: If the point of the article was to say, "Hey, WW is pretty cool you should try it" then you accomplished that task with me. Thanks Raddman - all valid points :) Just wish there was a sarcastic font so folks didn't take things so seriously, I write like I type...and I'm sure my physical smirk and nudges would ease the language quite a bit in person...but I'll take note of it for the future. I dunno about that...Sarcasm out right in person might get you some violence. People tend to respond to rudeness with physicality. As I am sure you are quite aware. I think what you mean to say is you wish people would just assume you are kidding about everything and aren't really the villain you paint yourself to be. In which case Id agree that you probably aren't. But being provocative will get some people going, even if it is in jest. you are right here. Unfortunately unless you use Italics(which is about the only way to clarify a change in tone) then sarcasm unfortunately does not transfer well. I love sarcasm in person since it add a little bit of humor in face to face conversations. I like that you're experimenting more with images to make your articles more aesthetically pleasing. The Unmake / Outlander one was nice. Some I didn't enjoy, like your "What a Mess" picture, since it was a bit hard to see what's happening. You'll get that groove though. The article in general was hard for me to follow and came off as arrogant. Congrats on getting 1st, but come on, you played in a PE with a record-breaking 24 Goblin decks and you piloted WW, the best matchup for you. I really don't care that you steamrolled a lot of Goblins, I expect it. Why no discussion about the Teachings deck you beat in the semi's? It's a harder matchup at least, could've been interesting read. You also play tons of PEs. Nearly every single one for the past couple months as the PDCforums records show. You obviously don't win the majority of them. How about discussing the factors involved in those? What was the meta like? What were your pairings? Good draws, bad draws? Mistakes? I like it when you discuss card choices to fight against certain matchups. You mention you might have ran Kor Sanctifiers if you anticipated "Junk." That's educational. Card analysis is great reads too. Briefly mentioning important stats that factor in on your success/failure would be nice to see though. No one wants to read turn-by-turn, but if your opponent mulls to 5 and gets land flooded while you have a perfect draw then it makes sense when you say, "I won." Likewise the opposite is true. No details and going on and on with a narrow view of your success without some details isn't educational, just self-glorification which is getting negative feedback. A more critical analysis will get you more positive feedback next time. With your staggering PE participation record, you're probably one of the best people to be covering the events. If you cut the self-serving bias and discuss more hard facts then you could find yourself in a niche that has a large audience. My two cents. EDIT: Eek, sorry it turned out long! I was trying not to do a round/round thing..for a change. Hi, Can I ask why Oblivion Ring never even got tested in your build? From an amateurish stand point, the Oblivion Ring would make my deck, so why shouldn't it??? I tested it a lot actually...great card. Just usually needing to be pointed at creatures and thus journey is simply cheaper/better. I'm not knocking it...I've lost a few to some crazy white removal. O-Ring is not played because pauper has no planeswalkers and has very few enchantments or artifacts that substantially effect the game state. When those actually exist in the meta, pauper also has some of the best targeted enchantment/artifact destruction ever printed. So what's left are creatures, and journey is cheaper and can hit animated lands. All this nicey-nice/I'm the bad guy etc.., cracks me up...so my next article will be super glossy/Mr. Rodgers style safe, should be a fun one. I'll make sure to stress how 'winning isn't everything' and all the other things that are causing America to fall behind this vernier of mediocrity that's oddly becoming the norm and more socially expectant of everyone, everyday. KID: "...mom its 30- 4! Were whoopin' em!" This is the world you're talking to, not just this America place. Well said JMason - I appologize for my cultural ignorance. Just a competitive guy ranting a bit too quickly at the keyboard over what sissies we (The USA) have become. Where are you from? Hi, I'm from England. I hope you didn't think I was bashing you before. And you're right, it pays to think twice before posting something, you always want to give the impression you know who your audience are and talk at their level. Looking forward to your next article already. Screw Jimmy, I agree totally with what you are saying. Let's not dilute the integrity of competition by doing crap like that. Continue writing the way you do, just remember there is a hint of truth in sarcasm. It's like saying, hey your an (insert cuss word here) lol, just kidding. You are being sarcastic when in fact you might actually think that about the person. There is always a hint of truth to sarcasm, when writing you need to remember that. One thing is for sure, your writing style has envoked tons of comments either good or bad, at least you know people are reading. Being edgy as a writer isn't always a bad thing. This happens in radio, Look at Rush Limbaugh, he probably has just as many Democrats listen to his show as Republicans. You also have to remember that just because your writing with a sarcastic tone, doesn't mean people read that same way. Exactly. Don't change it. Just be aware of it when responding to comments. Be who you are, and accept the consequences. Watering it down or being a phony would be much much worse. deluxeicoff...you're missing the point. It's not about the tone of your article. It's about the fact that there are unnecessary additions to the article that substantially distract the reader from its message. Pare it down to the facts, avoid the embellishments (e.g. "crush", "smashed", "fishing in a VERY lush stream when you like sushi"), and get rid of extraneous information (e.g. I'm an athiest...wow, I'm much better off knowing that), and people will actually pay more attention to the meat of your article. Those additions basically give the reader that the deck isn't as strong as you claim it is and that they are being fed a sales pitch. I think the message is a bit too simple to have an entire article around. I simply add colorful commentary, however controversial, to lighten up the slow-paced-droolings that are all too often a copy/paste effort by lots of writers to mimic what's been done. I honestly appreciate, (even yours mr. Anonymous :) all these insights. Please understand, had I done the above, I'd still be getting hate...if you need proof, just click on any article by anyone..there's a damn good chance of hate even in card choices, layout...anything! Very little in the way of positive feedback etc.., it's about a 9:1 ratio. "Thank God I won that one!" - then typing things like you did; (wow, I'm much better off knowing that) is quite hypocritical...and even more so, just bad, as you can say that about any colorful writing style! Are writers to be purely vulcan/logic only in your world?!?? That'd make for an awfully boring read,...this..then...that...this -the -that...SNOOZE. As said above, a lot of this style is to get some dialogue going, good or bad. I wouldn't say that the ratio of hate to positive feedback is 9:1. However I might have a slightly different definition of positive feedback than you do. From my experience, feedback generally comes in these forms. 3) Someone furthering a discussion that was brought up in your article. While number 1 might be rare. I consider 1-5 to be positive feedback and number 6 to be the only bad feedback or hate you can get. From my perspective, most feedback given on this website is positive. Actually I think you did that well. Except for the one jumbled image which was confusing. No walls of text here. As far as formatting goes, one tool that I use extensively is Microsoft Excel. You can cut and paste formatted tables from Excel to your article with very little loss of information. I format most of my information in Microsoft Excel, then cut and paste it into the article and then adjust the width of the tables as needed. To me at least it is much easier than messing with the table buttons in the article editor. Tables are one of the best ways to add color, section dividers, and a multi-column layout your article in a visually interesting way. Being provoked by the content of some people's comments here, I named my subject counterwise. Get a grip. He's not bragging, if you think so, you're lucky to not have met a real bragger. What I percept though, is jaleousy. Why even care to comment how he portrays himself? Having read through this, it gave me a lot of useful information, and it went straight to bookmarks. That was the intention upon making it, and it delivered. I fail to see anything negative about this, other than a commenter's own problems. Read: It's easy to apply traits to others that matches your own.